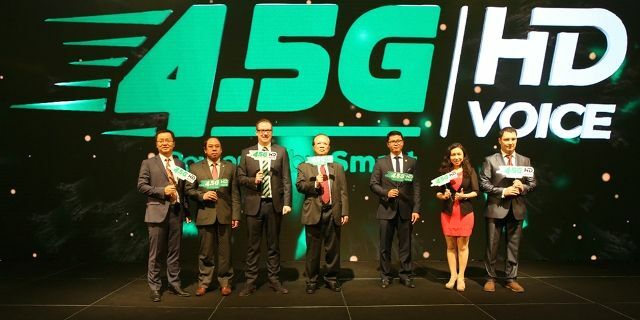 [Phnom Penh, Cambodia, August 22, 2017] Huawei and Smart Axiata, Cambodia’s mobile operator, announce the rollout of 4.5G mobile connectivity in the country, at a joint press conference themed “4.5G Evolution: Road to 5G”. This evolution of mobile technology will enable subscribers to enjoy 10 times faster average mobile Internet speeds than normal 4G. With the launch of 4.5G network, millions of Cambodian users will be able to enjoy streaming videos and entertainment content with greater ease and super-fast connection. In a foreseeable future 4.5G technology can also facilitates Smart to provide new services to households & verticals on existing network, such as wireless home broadband (also known as WTTx), HD video, IoT services and among others. The milestone was announced in the presence of H.E. Tram Iv Tek, Minister of Posts and Telecommunications of Cambodia, Dr. Margaret Hu, President of Huawei Global Wireless Network Marketing, David Li, CEO of Huawei Technologies Cambodia, and other senior executives. “I’m very pleased that together with Smart, we are able to build a better connected Cambodia through accelerating the mobile broadband development. With increasing demand for personalized and diversified services, emerging markets represent tremendous new opportunities for the telecom operators. Huawei is committed to supporting operators seize new opportunities by driving sustainable development in emerging markets”, stressed Dr. Margaret Hu. Huawei is dedicated to supporting operators of emerging marketing to achieve business successes through looking into their business processes, identifying structural issues, and effectively maximizing the returns on investments. With highly efficient and innovative products and solutions, Huawei partners with operators to deploy and maintain networks in an affordable manner, which enables them to enrich life for people and grow sustainably in emerging markets.